A coat rack with a top shelf and storage bench. Is there anything Layne can’t do? Or hide for that matter. Go ahead and put this hall stand to the test. 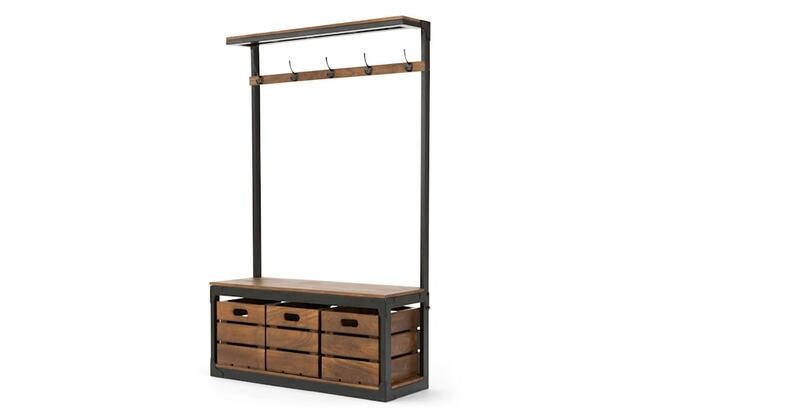 Inspired by locker room storage, this hall stand gives your home that on-trend industrial feel. Mango wood matched with black matt metal and exposed details make it a standout piece. The lower storage bench is perfect for shoes, shopping bags and other odds and ends. Take a seat, tie your laces, pull out the drawers and rummage around. You’ll be out the door in no time.